CONNIE COUSINS/For the Gazette The Play-Doh Playdate is a popular event on Thursdays at The Makery in State College. The Makery opens its doors to children weekdays from 10 a.m. to 2 p.m. to allow them to be creative through art. STATE COLLEGE — Need to get your preschoolers out of the house and occupied for a change of pace? This time of year when it’s cold and dreary can be especially challenging for the mothers and caregivers of preschoolers. The Makery, at 209 W. Calder Way in State College, has an answer for those winter blahs. The staff at The Makery is offering an open studio for kids from Tuesday through Friday from 10 a.m. to 2 p.m. The cost is $5. The children can stay for as long as they can stay interested during the four-hour period. A kid-friendly coffee spot in downtown is a nice addition to the local business community. 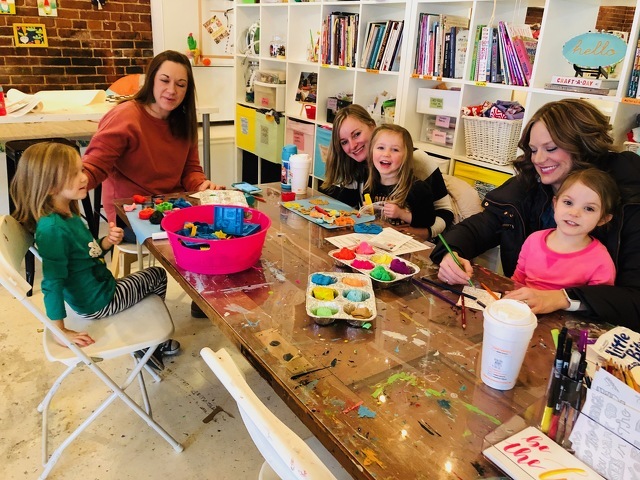 The partnership between Saint’s Café and The Makery allows patrons to enjoy specialty coffee and baked goods while they relax and watch the kids enjoy some creative playtime. Of course, visitors may stop in any time for coffee and a look around. The Makery offers many interesting classes and open studio times for all ages. Go to themakerypa.com to see what is available at this arts and crafts studio. The studio is filled with unique gifts and examples of the art that takes place there.